At Jackson ImmunoResearch, our mission is to develop the widest range of high quality secondary antibodies for the life science community. To support the growing adoption of camelid-derived heavy chain variable domain (VHH) technologies in a multitude of applications, including next-generation immunotherapeutics, medical imaging, analytical and diagnostic assay development and research discovery, JIR offers three new secondary antibody specificities for detection and quantification of camelid antibodies. Antibodies derived from camelid species such as alpaca and llama have unique qualities that have been exploited for creation of engineered antibodies. Since the first isolation of heavy chain antibodies from camel in 1989, researchers have focused on the 12-15 kDa antigen-binding VHH domain, commonly called the nanobody†, as a model for recombinant antibody production. Several distinguishing characteristics of VHH antibodies are their ability to cross the blood-brain barrier and access other remote locations, and to bind antigen tightly through a long CDR3 loop. Other advantages of VHH antibodies are that they are easy to clone and produce at high levels in recombinant systems, are stable to heat and pH extremes, and are generally quite soluble. Given their unique properties, VHH antibodies are being used in a variety of applications including diagnostic kits to detect small molecules, as biosensors and in numerous medical applications such as cancer treatment. VHH antibodies are powerful tools for discovery. Alongside the conventional IgG1, camelids (alpaca, llama, camel, vicuna and guanaco) produce two non-canonical immunoglobulins. IgG2 and IgG3 are known as heavy chain (or heavy chain-only) antibodies. They have single domain binding sites consisting of monomeric variable domains (VHH), and do not contain CH1 domains or light chains (Figure 1). Figure 1: Alpaca and llama immunoglobulins (*In camels IgG2 is described as having the longer hinge (Maass et al., 2007)). Jackson ImmunoResearch Anti-Alpaca (H+L) and Anti-Alpaca (2+3) are suitable for detection of both alpaca and llama IgG. Figures 2 and 3 detail the detection of IgG subclasses from both species by Western blot. Figure 2: Detection of alpaca IgG subclasses by Western blot. 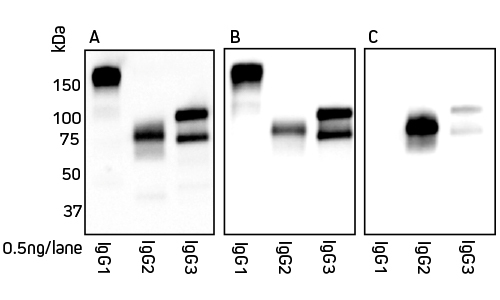 Blots were probed with secondary antibody as follows: Panel A, Peroxidase AffiniPure Goat Anti-Alpaca IgG (H+L) 128-035-003; Panel B, Peroxidase AffiniPure Goat Anti-Alpaca IgG (H+L)(min X Bov, Hu, Ms, Rb, Rat Sr Prot) 128-035-160; Panel C, Peroxidase AffiniPure Goat Anti-Alpaca IgG, subclasses 2+3 specific (min X Bov, Hu, Ms, Rb, Rat Sr Prot) 128-035-229. 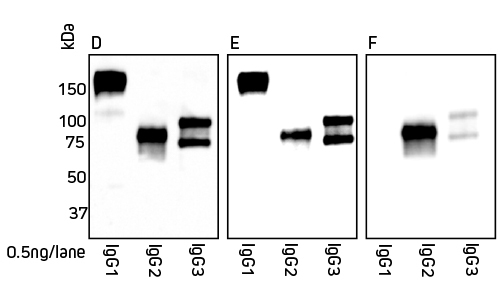 Figure 3: Detection of llama IgG subclasses by Western blot. Blots were probed with secondary antibody as follows: Panel D, Peroxidase AffiniPure Goat Anti-Alpaca IgG (H+L) 128-035-003; Panel E, Peroxidase AffiniPure Goat Anti-Alpaca IgG (H+L)(min X Bov, Hu, Ms, Rb, Rat Sr Prot) 128-035-160; Panel F, Peroxidase AffiniPure Goat Anti-Alpaca IgG, subclasses 2+3 specific (min X Bov, Hu, Ms, Rb, Rat Sr Prot) 128-035-229. The development of engineered VHH antibodies can be initiated by immunizing an alpaca or llama with a protein of interest. Monitoring of the immune response enables a researcher to harvest PBMCs at an optimal time, after in vivo maturation has resulted in a diverse repertoire of specificities. JIR Anti-Alpaca secondary antibodies can be used to distinguish between total IgG and heavy chain antibodies in camelid serum during the immunization regimen. The heavy chain (subclasses 2 and 3) antibody response may mature differently from total IgG, and harvest of PBMCs producing VHH (from heavy chain antibodies) can be optimized. Serum conversion (antigen-specific antibody titers) can be monitored by ELISA or by flow cytometry/FACS (Pardon et al., 2014). JIR Anti-Alpaca IgG (H+L) can be used to monitor pre-immune and post-immune serum conversion. JIR Anti-Alpaca IgG2+3 is ideally suited to measure heavy chain antibody serum conversion to enable optimal timing of PBMC harvest for VHH library construction. As shown in figure 4, generation of heavy chain antibodies may not be predicted by total IgG readings. After immunization with the protein of interest, ELISA was used to characterize the specific antibody response. The protein of interest was coated onto the ELISA plate, antiserum was used as the primary antibody source, and peroxidase-conjugated secondary antibody 128-035-160 or 128-035-229 was used to detect total IgG or IgG2+3, respectively. Figure 4a: Serum conversion kinetics. Products 128-035-160 and 128-035-229 were used to measure antigen-specific antibody titers in alpaca serum over the course of a typical immunization/boost schedule. Figure 4b: Percentage of IgG2+3 compared to total IgG by ELISA. Total IgG titer might suggest a harvest point at 150 days, but the IgG2 and 3 response is not optimal until after 300 days post immunization. 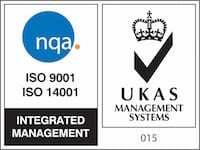 We are delighted to offer 3 new specificities to our range! JIR’s Anti-Alpaca IgG (H+L) antibodies recognize total IgG from both alpaca and llama. This antibody enables detection of the heavy chain subclasses 2 and 3 from both alpaca and llama serum and PBMCs, without recognizing IgG1. **These antibodies react primarily with the Fc region, and are not recommended for detection of VHH antibodies (nanobodies†). Arbabi-Ghahroudi, M. (2017). Camelid Single-Domain Antibodies: Historical Perspective and Future Outlook. Front. Immunol. 8, 1-8. Daley, L.P., Gagliardo, L.F., Duffy, M.S., Smith, M.C., and Appleton, J.A. (2005). Application of Monoclonal Antibodies in Functional and Comparative Investigations of Heavy-Chain Immunoglobulins in New World Camelids. Clin. Diagn. Lab Immun. 12, 380-386. Maass, D.R., Sepulveda, J., Pernthaner, A., and Shoemaker, C.B. (2007). Alpaca (Lama pacos) as a convenient source of recombinant camelid heavy chain antibodies (VHHs). J. Immunol. 324, 13–25. Pardon, E., Laeremans, T., Triest, S., Rasmussen, S.G.F., Wohlkönig, A., Ruf, A., Muyldermans, S., Hol, W.G.J., Kobilka, B.K., and Steyaert, J. (2014). A general protocol for the generation of Nanobodies for structural biology. Nat. Protoc. 9, 674-693. Wagner, H.J., Sehrle, S. Weiss, E. Cavallari, M., and Weber, W. (2018). A Two-Step Approach for the Design and Generation of Nanobodies. Int. J. Mol. Sci. 19, 1-16. † Nanobody and Nanobodies are registered trademarks of Ablynx N.V.